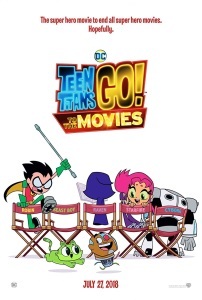 Currently hovering around 90% on review aggregator Rotten Tomatoes, Teen Titans Go! to the Movies is heavy on musical numbers, superhero gags, obscure pop culture references and, of course, fart jokes. This was not unlike watching eight 11 minutes episodes of the show in a row. You may consider this good or bad news, depending on your personal tastes. I did not think the pop culture references hit the clever deep dive (for a kids' show anyway) marks that the tv show does, the loopy lengths that gags went to diud not go as far out on a limb as usual, and the reliance on bathroom gags seemed higher than normal. The pacing also suffered a bit in my eyes from the expanded run time. For me, the show is one of the more enjoyable things (for me) that my kid watches on tv, but the movie was juuuuuust tolerable and only intermittently funny. It could also be a matter of my patience with the material not being able to run to 88 minutes. I saw it with my nearly-7 son and my 10 year old daughter and we laughed a lot. It was very silly and there were honestly more dance numbers than I expected. It does feel relatively episodic though there is something of an overarching story. Seen Dan Hipp's art on such a big screen was a treat. And I'm pretty sure that Jade Wilson was visually based on Andrea Romano. Going in, I wondered if they'd even maintain continuity throughout the whole movie. I enjoyed the Marvel references - in the opening credits, Deadpool, Stan Lee (!!!). That was Michael Bolton as the singing tiger in Upbeat Inspirational Song about Life. The joke about "Martha" was on the chopping block for months. The six-pack rings and Aquababy! The pearls on Martha Wayne!